Sometimes, when we become very adept at using certain techniques or materials, we get a little carried away with our designs. Huge and elaborate jewelry that takes hours and weeks to complete provides a stunning showpiece, but jewelry should be fun and exciting, too. Every once in awhile, even the most experienced beader should just take it easy and create. 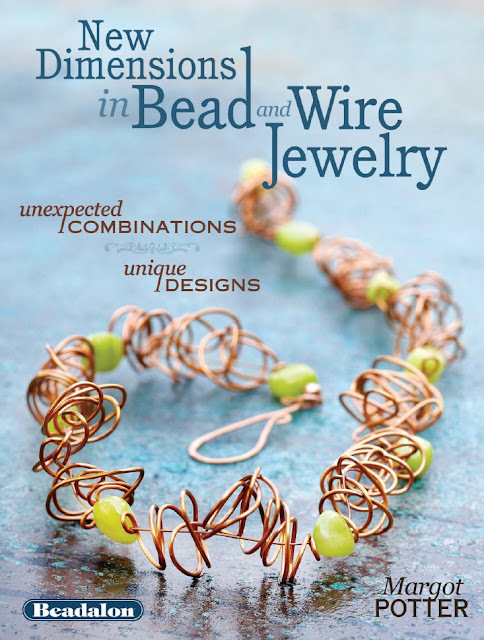 New Dimensions in Bead and Wire Jewelry is a workbook for beaders and jewelry designers that carefully guides you through the techniques and elements you need to create stunning, unique jewelry that relies on different types of wire. The book is divided into five chapters: Foundations, Thinking in 3-D, Sculptural Concepts, Architectural Exploration, and The Fifth Dimension. The projects start off easy, giving readers a taste of the techniques used to create with both beading wire and shaping wire. In the final chapter, Margot combines and mixes wires and techniques in stunning jewelry. Each of the 30 projects includes a full materials list, step-by-step instructions with large, easy to follow photographs, plus design tips and variation ideas. Margot’s charming humor comes through on every page, with cheerful introductions that only enhance the vibrant and whimsical necklaces, rings, bracelets, earrings and even a tiara. 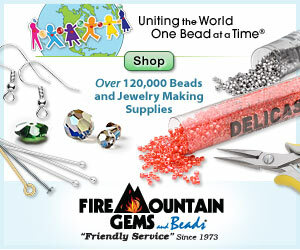 Margot Potter is no bead snob, so if you love beads in all forms, you will enjoy the combinations of metals, glass, crystals, gemstones, plastics, buttons and found objects. If you’re a beader that lives to crimp, the variety of exposed wire projects will be a delight. There are also plenty of designs that use wire jigs, hammering, freeform shaping, and wire weaving - including a delightful netting style bracelet. I would like to thank North Light Books and F+W Media for giving me the opportunity to preview New Dimensions in Bead and Wire. Inspirational Beading has not received compensation or merchandise in exchange for this review. I have shared my sincere opinions of this book. Nice review. I too review for several different publishers. Come visit my blog for a review and a giveaway. You are most welcome, Margot! Thank you for sharing so many fantastic designs and for keeping crafters smiling!